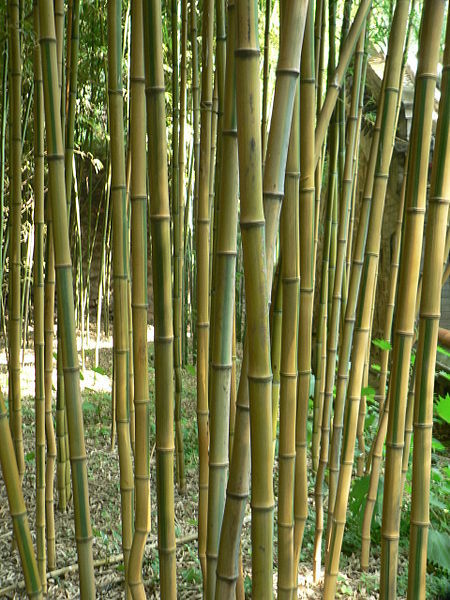 In quite some gardens, bamboo is a serious plague rather than a beautiful asset. This is because of the fact that this exotic was often planted without prior notice, with all the consequences. It is not exceptional the hear about fences begin pushed aside, ponds being pierced or relationships with neighbors really being put to the test due to wandered of bamboo runners. In this article you will find all relevant information in a clear and easy to read summary. Bamboo can be roughly classified into two groups; clumping and running bamboo. Each bamboo forms underground rhizomes, but in clumping species, growth remains concentrated to one grove. Depending on the species, the size of the final grove varies between 1 and 2 meters (3-7 ft) in diameter. With the running species, the runners can show up far much further from the grove. A few meters are bridged effortlessly. These species should therefore be limited if you wish to keep the bamboo within a certain area. When planting a running bamboo, you should seriously consider to install a root barrier as well. Note that not any material is suited. Concrete doesn’t form a serious obstacle by exemple and your bamboo eventually will get through! 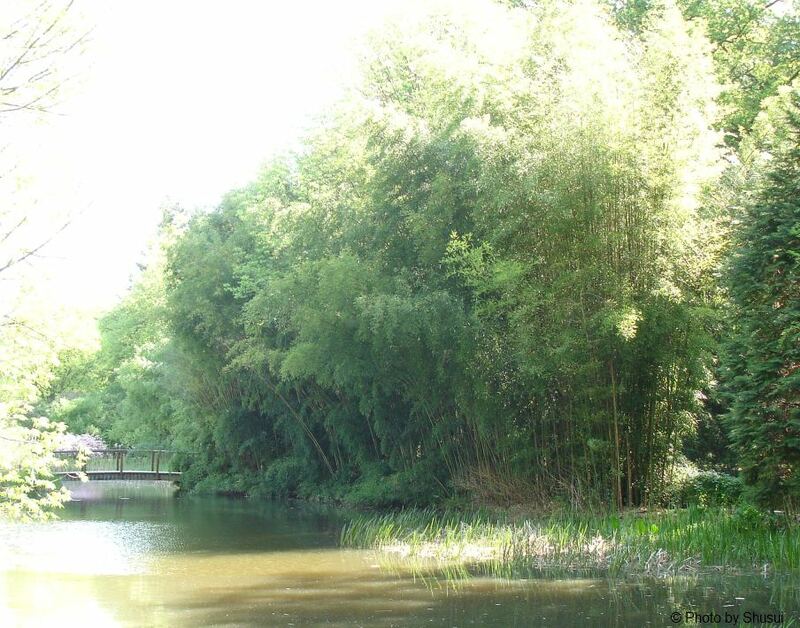 The only suited material is the HDPE plastic sheet available at your local bamboo specialist. This barrier exists in different heights between 50 and 70cm (20 & 30 inches). The price is usually around € 4.50-5.00 / stretching meter. The needed height depends on the species that you intent to use. Large nurseries, sometimes deep trenches as well to limit their bamboo into a certain area. The rhizomes are hampered by the light. But for a typical, small sized garden, this method is probably not really suitable. There are a lot of different bamboo species. 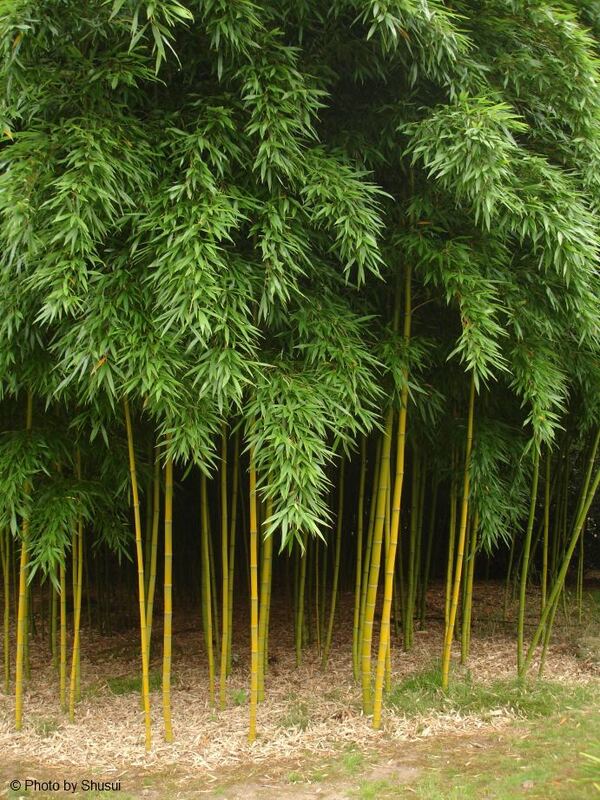 Most gardeners prefer thicker canes but do not like the idea of having a runner bamboo. Unfortunately those two characteristics don’t go hand in hand. You will have to choose between rather thick canes or a clumping species. For the average gardener it maybe difficult to know by heart which species is a runner and which isn’t. And unfortunately you can’t always trust the seller neither. Therefor we create a simple summary divided into running and clumping genera. 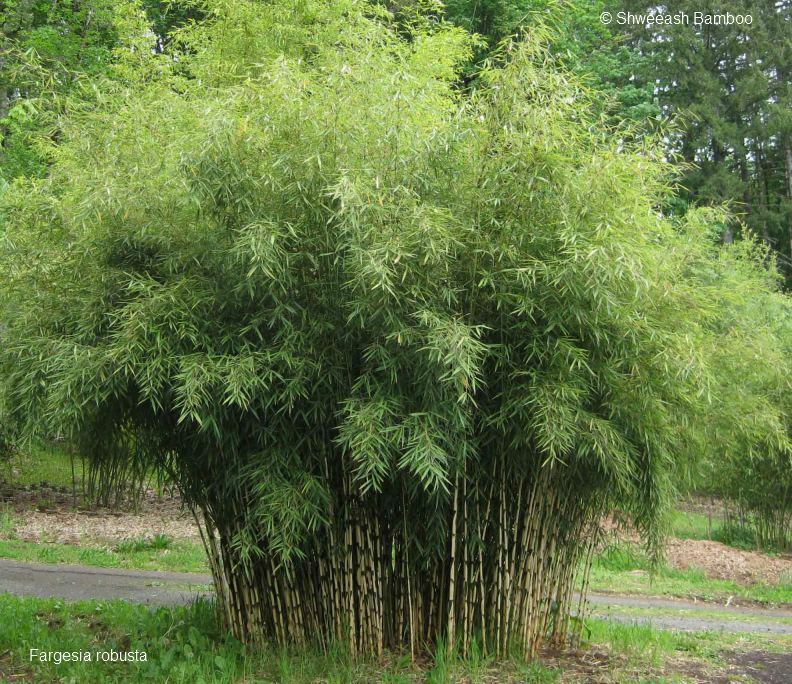 Mostly it is the Fargesia (clumping) and the Phyllostachys (running) that you will find in your garden center which makes it a lot easier to remember. An other well known runner that was often planted is the Pseudosasa recognizable by its big leafs. Every genus does count multiple species of cours but within the genus they will have the same characteristic concerning running or clumping. There maybe slight differences, as certain Fargesia species which do develop wider groves as the Fargesia sp. ‘Scrabida’, the Fargesia robusta ‘Wolong’ and the Fargesia rufa but the certainly are no running species. 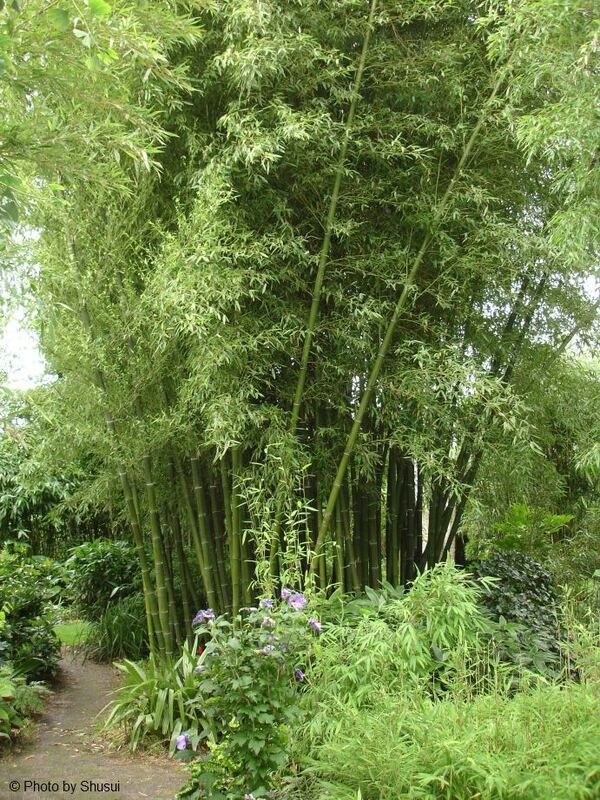 The bamboo with those nice thick canes is the Phyllostachys vivax. You will also find from time to time “new” species with nice sounding names both mostly it’s just a commercial way to sell classic species. The distinction between regular and water species is not always as easy to determine. For example, the P. atrovaginata and P. parvifolia resemble each other. 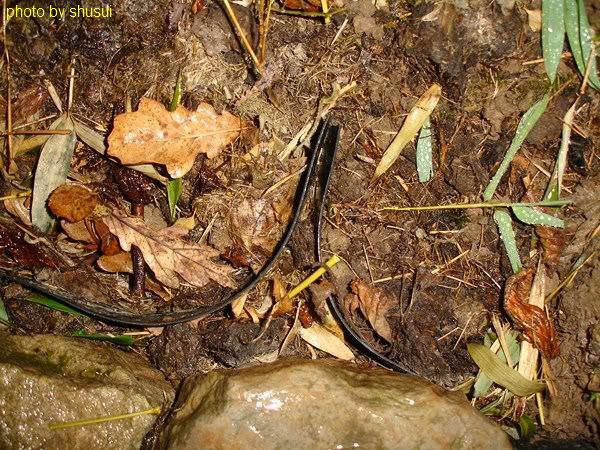 An important determining feature is the air canals in the rhizomes. 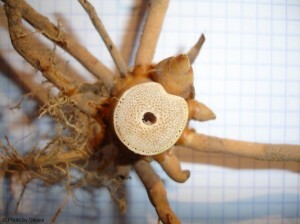 In this photo, it is therefore a rhizome of the P. atrovaginata. Bamboo is not very demanding in terms of emplacement. However, certain species are more appropriate as a solitary were others are perfect for forming a hedge. Also, some species do cope better on more shady spots were others stand well in full sun as well. For the best result, do inform yourself which species does fit your needs the best. 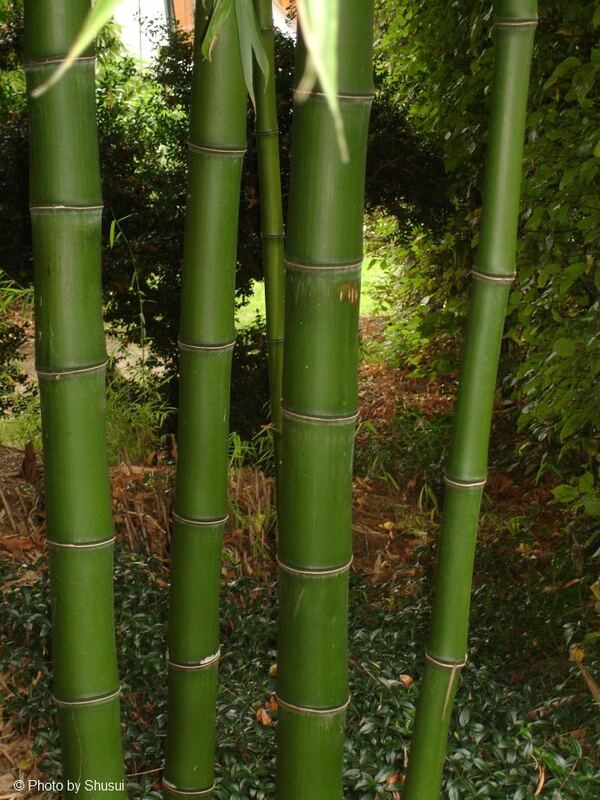 As for the soil type, bamboo does not require any special adjustments. 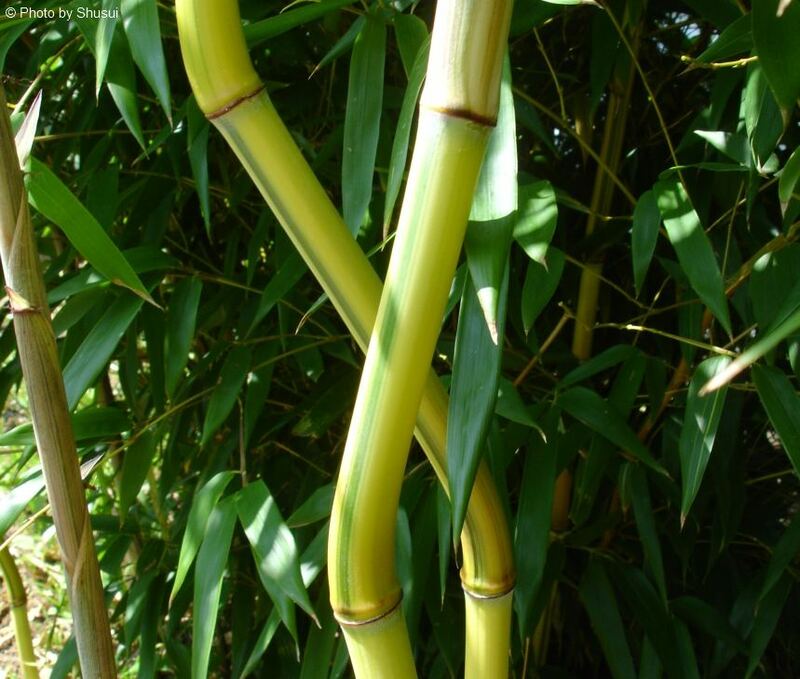 However, bamboo needs a lot of water, which means that too dry surfaces need to be watered much more in the summer. When creating a hedge, the individual plant distance depends on how fast you want a tight hedge. If you plant 2 plants per meter (3 ft) you immediately will have a tight hedge. If you put 1 plant per meter, the hedge will close up after 2 to 3 years. If you plant even less, you can choose to divide your groves after a year of 3 and replant these divided bamboos in the hedge. Best of all, the bamboo is planted about 100 cm from the yard limitations to prevent culms showing up at the neighbors too. For growing in containers or large pots the Fargesia rufa is the most appropriate. But you will have to water sufficiently to prevent it from drying completely. 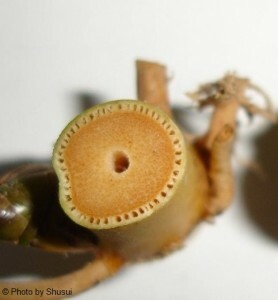 Bamboo is a simple plant in terms of care. It needs little attention as long as it gets enough water. On warm days a water shortage will manifest itself by curled leaves. As soon as water is given (in time), the leaves will open again. 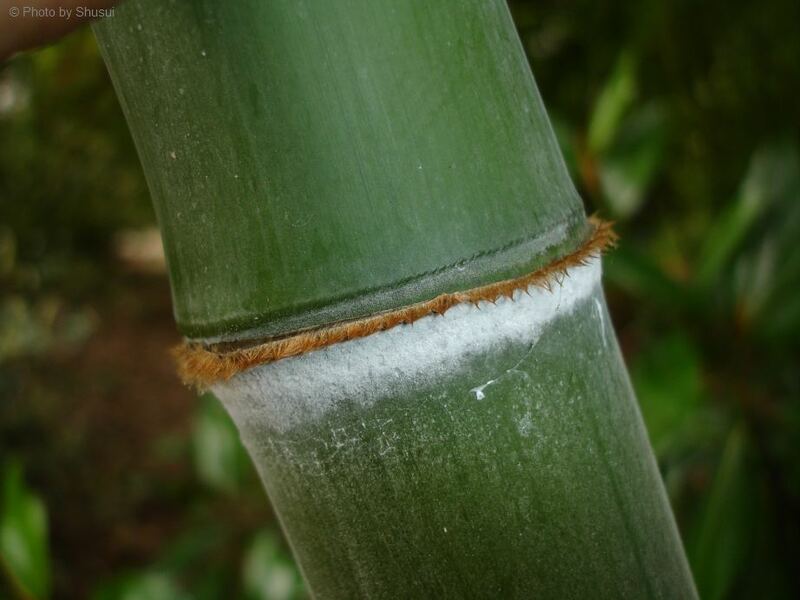 Fertilizers for grasses can be used although special bamboo fertilizers do also exist. Pruning is not really necessary unless you want to model your grave a bit. 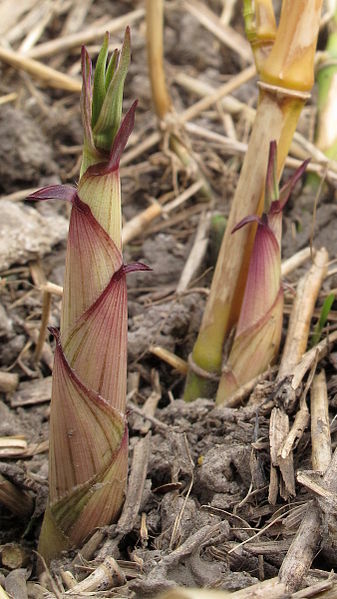 Generally, new culms are formed just once a year (exceptions do exist) in spring which grow out to a mature cane in matter of weeks. These newest canes are thicker than those of last season. It could be useful to thin out the grove once a year by pruning the older (thinnest) canes just above the ground. If desired, the side branches can be cut off the nodes wherever and whenever you want. 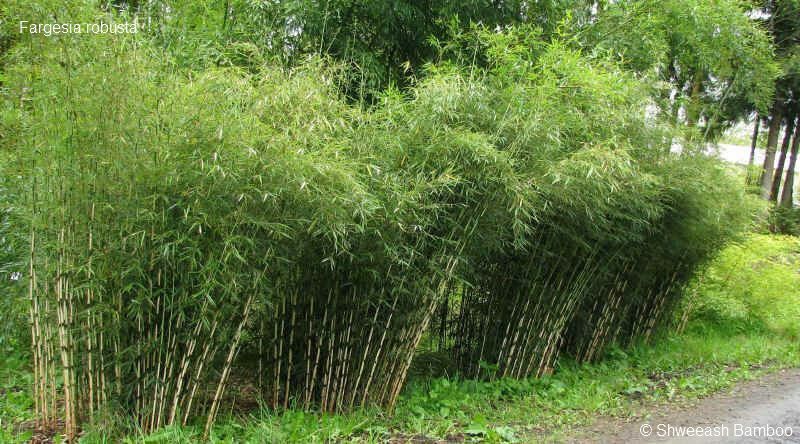 Most bamboo species are hardy in our climate. However, the new culms can be protected in the early spring against night frost by means of a mulch layer. Do not prune ugly canes too quickly, especially on the clumping species as the stock most of their energy in their canes. Do also not loose your hope after a severe winter. Who knows, the bamboo still will shoot, a bit later in spring. Runners that show up too far away from the grove can be cut off using a spade. If it had enough roots you even can replant it again elsewhere. 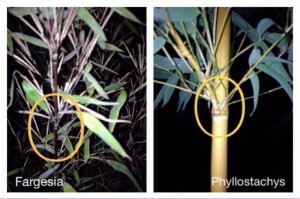 After the bloom, most bamboo species die completely. Sometimes is mentioned specifically that the species has recently flourished. This is because bamboo flourishes very rarely (up to many decades between bloom). Now you know that you can buy this species with a restful heart. This is, for example, often the case with the Fargesia ntidia varieties. In order not to place a rhizome barrier, we mainly have Fargesia species planted. The Fargesia robusta ‘Campbell’ is our favorite for the hedge. 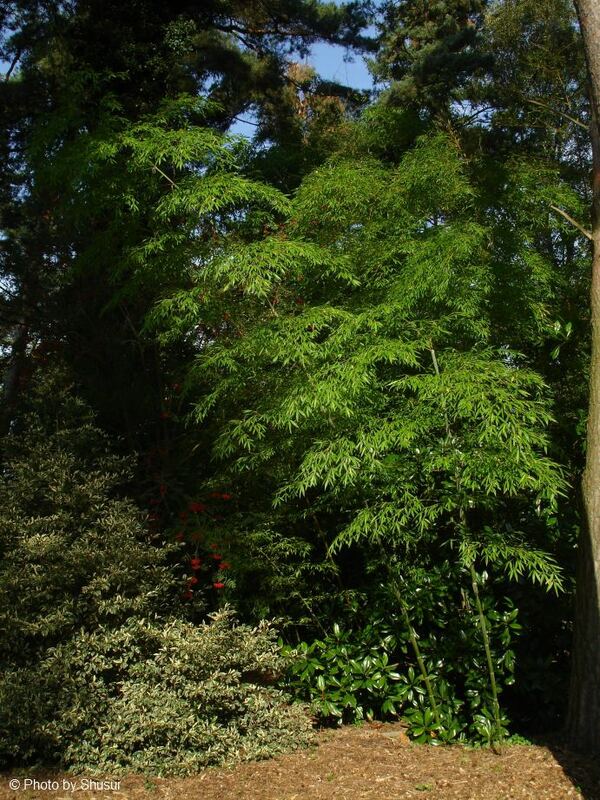 As a solitary, we have a Fargesia denudata ‘Lancaster 1′ which bends over gracefully with the top-heavy canes. For a somewhat wilder effect we also planted a Fargesia robusta ‘Wolong’ as solitary. This species is a bit wider, but as the garden is big enough this isn’t a problem at all. 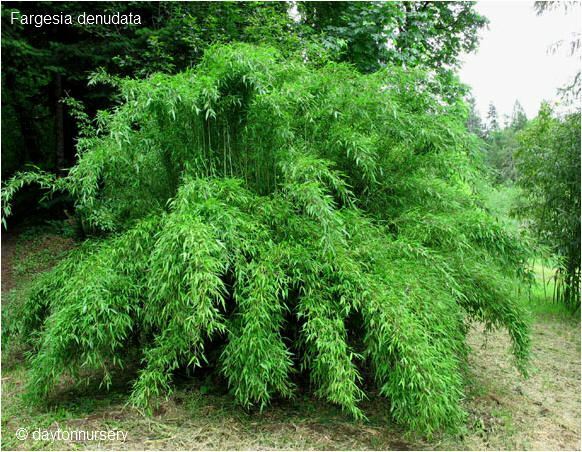 Furthermore, we are also a fan of the Fargesia rufa. Not only is this plant very versatile; Solitary, hedge, tub, … he also proved to be very hardy.